UPDATE – richdrogpa sent a message Feb 2018 that the TIMS card is no longer required for this trek. Instead you buy a trekking permit in Lukla (NPR 2,000) as well as the National Park entrance ticket (as before) NPR 3,390. — But an update from Dec 2018 says you need National Park and Khumbu Pasang Lhamu Rural Municipality pass – both NPR 5,000 and both available on the trail. So check when you get to Kathmandu. There’s NO shortage of information on how to hike to Everest Base Camp (5,320m / 17,450ft) in Sagarmatha National Park, Nepal. You can do one, two or three of those. Pokalde Peak 5806m (19,048ft) is an option, too. But requires a Climbing permit as does the much more popular Island Peak 6,189 m (20,305 ft). The sacred Gokyo Lakes is a superb side-trip. Don’t miss it. 16-18 days minimum for 3 Passes. 21 days would allow for rest / illness / sidetrip / and other unanticipated delays. if you don’t have time, it’s minimum 14 days just to get to Base Camp and back safely. walk with no tent, stove or food. Stay in lodges, eat in lovely restaurants. Books are even available on the trail! Everest is the goal. But our favourite peak is Ama Dablam, much more visible en route. guest houses sell “hot (luke warm) showers” for about $3. at altitude, food tastes GREAT. The bakery in Tengboche is particularly good. First concern of many is the flight in to Lukla Airport 9,380ft (2,860m), officially named Tenzing-Hillary Airport since 2008. Click PLAY or watch a flight on YouTube. Most Extreme Airports, broadcast on The History Channel in 2010, rated the airport as most dangerous in the world. There have been plenty of accidents. Statistically, however, riding a Nepali bus to the Jiri trailhead may be even more dangerous. About 95% of Everest trekkers fly leaving the Jiri walk-up uncrowded. if your plane lands, this is a surprisingly safe adventure. Even for solo trekkers. but the 3 passes are challenging. For example, Kongma La 5535m, is about 9hrs. No facilities. Remote. Rugged. Here’s Pokhalde Base Camp. all 3 passes are weather and health permitting. It’s easy to skip any one of the 3 if you are hiking independently. November 1995 a freak snow storm killed dozens (46 some say) of hikers, porters and guides throughout the Himalaya, most by avalanche. Bring suitable clothing. 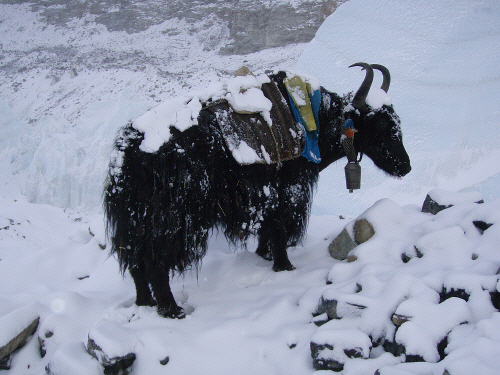 This Yak knows how to dress. Main trails are easy. But crossing glaciers is can be difficult and dangerous. Get local advice before you do so. some hikers buy Diamox in Nepal. It’s called Diamox Sequels in the USA. you’ll be tempted by pizza, beer, German bakeries and everything else. Almost everyone spends more money than they expect. be wary of crossing bridges if you see pack animals — or heavily laden porters — approaching from the opposite direction. You might be knocked down. All guides and lodges have phone. Some hikers have working phones. And phones seem to work almost anywhere. You might first put off by telephone contact in the “wilderness”. But consider how many lives have been saved by modern communication. slow internet is available too. At cost. Right up to at Gorak Shep 5,164m. In 2016 you could do it for $400-$500 (2-3 weeks) to and from Lukla, independently. Sam and Danielle only spent about $40 each carrying their own packs. But 2 Drifting Coconuts spent $726 each for 16 days trekking independently. It could cost 5 times as much to sign on with a high end guiding company. But some are only about $1500 for 20 days. Plus expenses like visas, meals, beverages, travel insurance (including helicopter evacuation insurance), tips, etc. Budget $2000 total / person for Everest guided. carry more Nepali rupees and American dollars in cash in case of emergencies. There’s actually a bank in Namche, though it’s best to bring in all your cash from the city. Lodges and restaurants in Khumbu only accept rupees..
there’s a slight chance you’ll need to be evacuated. Have a credit card to pay that. Or purchase travel insurance. Check what the policies cover under “Adventure Sports”. It varies depending what nation you live in. World Nomads has been recommended. Some of their policies cover trekking up to 6000m. Sadly some in Nepal organized a helicopter evacuation insurance scam to profit from suffering hikers. Check on that when you buy insurance. In 2018 a tourist visa for Nepal cost 5 days=$25, 30 days=$40, 90 days=$100 are available on arrival. Very convenient. get a trekking guidebook well in advance and decide on your destination each day. That way you can adjust for weather and fitness. It’s fairly common to take a rest day while ascending to acclimatize for altitude. if you want to fly out, buy your flight out of Lukla in Kathmandu. In advance. You can change the date of your return, if necessary. It might be difficult to get a seat on a plane if you try to buy in Lukla. Almost none of the independent hikers tent. Yet BestHike editor Rick McCharles did (a few nights). Tenting is absolutely unnecessary. But Rick enjoyed the experience. Surprisingly, dispersed tenting is not illegal in the National Park. But it’s best to be discrete. Here’s the goal for every Base Camp trekker. Kala Patthar as seen from Gorek Shek. The intimidating mountain in the background is Pumori 7161m (23,494 ft). And there is the BIG mountain as seen from Kala Patthar. From the Nepal side, it’s difficult to get a good look at Everest. You must earn the privilege. Many also trek to Everest Base Camp. It’s a harsh place. This Google Earth flyover of a Base Camp trek via Cho-La gives you an excellent idea of the terrain. It includes a climb of Island Peak (6,189m/20,305ft) after acclimatization. Hiking independently gives you the freedom to decide each day where you want to go next in the Khumba. There are many, many options. A guide will show you around, but not carry your gear. They may be Nepali or foreign. Many hikers are happier to be led — though you certainly can do the entire Circuit on your own without a guide. A good guide may enrich the trip for you. We did the hike in 1998 independently, but by the finish wished we had hired a guide, at least for parts of the Circuit. A porter guide from the Trekking Workers’ Association of Nepal is a local who speaks English who may also carry a limited load, perhaps 15kg (33lbs). You can hire a porter guide if and when you need one on the trail for something like US$10 / day plus tip. There is often an insurance fee added. If you are not confident to go independently, check Trip Advisor Everest for recent recommendations. Don’t sign on with any company until you are sure they can deliver what you want. We don’t recommend any specific company on the list below. It’s simply a starting point if you choose to hire your own guide. Kristen loved her trip with Anywhere Plus. weather permitting, there are dozens of flights everyday Kathmandu to Lukla. Tara Air and Agni Air are supposed to be slightly less scary than the other airlines. Lonely Planet Trekking in the Nepal Himalaya (2009) – Bradley Mayhew & Joe Bindloss – is the first guide you should pick up. It’s got a good overview of 3 Passes. Yep. We still like Lonely Planet best. Leave a comment if you’ve got an up-to-date 3 Passes trip report to recommend. Gareth Leonard found hiking Everest tough. Click PLAY or watch it on YouTube. If you are seriously researching 3 Passes, sit down and watch this mini-documentary. The traveling Freeses go to Nepal and hike to Chukhung Ri, Kongma La, Everest Base Camp, Kala Patthar, Cho La, Gokyo Ri and Renjo La – November 2011. Click PLAY or watch the first of Ryan Van Duzer’s videos on YouTube. Click PLAY or watch Longer the Better highlights on YouTube. Click PLAY or watch Hank Leukart’s trip on YouTube. Check our blog for posts tagged “Everest”. I liked your blog so much that I just changed my trekking plan. First I was going to trek Jiri-Lukla-Gokyo-Cho La-Island Peak-Amphu Labtsa-Lukla. I was going to do this independently except Amphu part. But now I think that I’ll leave the Amphu part to an other trip. How are the snow conditions in 3 passes during April-May? Any advice about the gear? I’ve been to the Himalaya 4 times, … in Oct/Nov. If you are carrying your own pack, my advice is to travel light. You can always buy anything extra you need in Nepal. Last trip I picked up (fake) Gortex jacket and down jacket at the factory in Thamel. I’m going in April, cannot wait ! Great information here to prepare myself a bit better. Great information, 2 Aussies heading off on this trek on 19th March. Looks fantastic and looks to be even better then our Peru trek. Hi, thanks for the greatfull info, I am going begin may to Kathmandu, will stay there 3-4 day than will do the three passes track. the only thing that i dont know is, do i need a tent because i dont know if everywhere louges. No need to carry a tent. It’s easy to trek lodge to lodge. Thanks for your amazing website – so many places to go! I’m planning to do 3 Passes independently in November. You mention that guides are available in most villages. Does this mean that it would be easy enough to hire a guide for the Kongma La day, or any other days involving potentially dangerous glacier crossings, difficult to follow trails etc? On arrival at any lodge, inquire. I’m sure you can hire a guide same day from almost any lodge. I just came back from Solukhumbu to Kathmandu. There’s another access point from Sallari/Ringmo. It’s about 2 days from Lukla (via the Jiri route). It’s a great alternative if you couldn’t get a flight out of Lukla. From Sallari it’s easy to hire a jeep back to Kathmandu, but be prepared to spend 18 hours on the road. Sometimes it’s also possible to call the jeep directly to Ringmo, it will shave 3 hours off. The cost is about 30 USD. Thanks Long. Good to know. Hi Rick, I went May the route via Thame then Renjo pass and cho la pass to ebc. Unfortunately i didnt go to kongma la pass because i hurt my ankle on renjo pass. Therefore i will go back next year because it was realy cool. btw i didnt not before trekking, that was my first trekking at all. and it was not difficult. Next year i would like do the annapurna circuit and the route from jiri to lukla and of course the kongma la pass. I would like do the island peak also do you have any info about the island peak, how can i get favorable to the island peak. I’ve not climbed Island Peak. Seems easy to join a group going, however, out of Kathmandu. Hello Bunyan, I am planning for EBC and three passes this October. I would like to get some information regarding this trek. Could you please drop me a message at ishpeaks@gmail.com. Thanks. Everest three pass trekking also call Everest 3 passes trek, high pass trekking in Nepal. Everest three pass trek is located in world popular Khumbu area. This is land of sherpa and first mountain Everest climber Ten jingNorga sherpa. 20 days long trekking Everest three pass trek provide to people to enjoy with breathtaking view of high mountain, Himalaya, Sherpa culture and green jungle still above 4000 m. so this all would be interesting for you. Everest three pass treks mostly love by adventures travelers and young student group. traveler have to cross 3 world highest pass which is above 5000 m and so there would be high chance of altitude sickness . so this we call in Nepal one of adventures activities to do this trek. I returned from Nepal June 1st and did independently 3 passes clockwise. I managed to find some amazing companions on my from Lukla up and we didn’t have any need for guides. But if you are unexperienced trekker the guide might be a good idea. However I did hire a porter for Cho La and Kongma La to keep up with my travel mates who have been in Nepal already over 4 months. I used the porter until the highest point of those passes. Price was about 3000 rupies for each pass. Sometimes local porter is a lot better guide than Kathmandu guide. We guided in two occasions groups with guides. For most guides it looks like compass and ability to read maps is not in their abilities list. I found the clockwise direction much better than the opposite. In both Cho La and Kogma La you can do the hard part first – glacier crossing and steep ascent. In Cho La we actually did the glacier crossing day before. And of course the scenery is better – all the beutiful mountains are in front of you instead back. In April in all passes it started snowing in the afternoon, but we managed to do all of them before the snowing started. In Cho La one guided group that came after us gat lost in snow storm, but they manged to find they way after snowing stopped. One advise I would give is give yourself time, for first week I thought that this is hell and I’m not in as good shape as I thought. All the up hills and lack of oxygen made me slow, short of breath and so week. My mates were use to high altitude after over 4 months in Nepal and as they were moving steadily and discussing the meaning of life, I was swearing and moving my legs very slowly far behind them. But after 10 days I realized that this is fun and I can even talk while walking. It’s mentioned on this page that in 2013 you could do the trek for about $400-$500 (3 weeks) if doing it independently. I’d be interested to hear a few more opinions on this from people who have done the trek in the past year or so. We’re going to do this trek in October 2014. We’ll be doing it independently, probably mostly sticking with the local food but probably with some apple pie and beer every now and then too. I imagine we’ll be happy to pay for hot showers every few days, and battery charging too. There will be two of us (my girlfriend and I). Also, are US dollars useful on the trek or only rupees? You need rupees. They don’t want dollars. That means taking enough rupees to be sure you don’t run out. … Which means you’ll probably spend more rupees than you expected. Hi Rick, my girlfriend and I are off to do the 3 Passes in October. Some people have suggested that it’s worth having microspikes (http://kahtoola.com/product/microspikes/) or something similar for the passes and glaciers. Is this overkill do you think? I’ve read various trip reports, some people say the passes are extremely dangerous and difficult, others say they’re no big deal (the comment above mine for example). It’s hard to know what to expect. Obviously we wouldn’t attempt the passes in bad weather, but apart from that, what precautions do you suggest? I would not take any special footwear for the snow and ice. The route is quite well trodden. Hi Drew, i did it in Mai 2014 and in my aspect the Chola pass was exacting then the other two. i dont know maybe in october is ther more snow. It is amazing there. I want to do it again. This post is amazing, and makes me want to ask you for some advice. It was suggested to me that i start hiking this trek form Jiri, because coming from a lower elevation means you get to pass through some more diverse terrain and landscape (this is a priority of mine). Is this something you would recommend? do you know how many days it would add onto the trek? would the section from Jiri to Lukla still have tea house accommodation and be easy to do solo? the other trek that has been recomended to me for the purposes of seeing a variety of terrain is the manaslu trek. could you say if one is better than the other for hiking in diverse landscapes (a variety of forests and more lush regions, as opposed the the more arid high mountain terrain)? Very few trek to Lukla. But the few I met that did told me they enjoyed it. There are teahouses, but not nearly as many. Get a good guidebook if you do trek rather than fly. I’ve done Everest and Manaslu over the past few years. For me Everest is slightly better. You cannot hike Manaslu independently, only with a guide. We did the 3 -passes and started from Paphlu which was great. Because of the weather there were no flights from Lukla to return to Kathmandu, so we walked out via Jiri (another four days). All in all it was a breathtaking tour which took us 5 weeks. The sights were great, the thin air no problem, but the four weeks over 4500m were very col! So take a warm sleeping bag and maybe a pee-bottle. First of all thank you for all the information about the trek. If you do not get that information in advance, go directly to this organization in Thamel, Kathmandu. It’s easy to find. They will send you to this big building, Tourism Board office in Kathmandu, not quite so easy to find. That’s where you get the 2 permits you need for Everest trekking independently. As being a owner of legal travel agency (Attentive holiday tours and travel) and legal trekking agency ( Himalaya Arirang Trek http://www.trekadventurenepal.com) I have great experience of arranging trekking packages in Everest region. If anyone is planning to trek in Everest please go through above post the post is providing correct information. If you have any question please feel free to email me. I will provide free information. Wish you a wonderful trekking in Everest. Those with enough time (3-4 weeks) prefer to start from Jiri. There are quiet trails and teahouses all the way up to Lukla. Solo and independent, no problem. I know I was altitude sick for a day on arrival in Lukla by plane. The only downside is the hellish ground transport to Jiri from Kathmandu. That scares me more than the plane landing in Lukla. Compliments for your fantastic website!!! I really like it! This Summer we hiked the West Coast Trail and Sunshine to Assiniboine and both loved them! We are considering to do the hike from Jiri to Namche Bazar and than continue to Everest Basecamp / 3 Passes. Would September (starting around September 1) be a good month to do this? September is NOT a good month in our opinion. November and May … and the months either side are best. September is end of monsoon. On the other hand, people do the trek year round. Wow, what an amazing resource. I’m planning to go to Nepal in mid feb to early March and the time is pretty much fixed. I was thinking of doing the Manaslu but after reading this I really want to do the three pass circuit (with Gokya lakes of course :)). Do you recommend this trek in mid to late Feb? Ill be bringing a tent in case a tea house happens to be closed. Thoughts? February would be nice, I think. But cold. Bring (or buy in Kathmandu) plenty of warm clothing. In that area enough teahouses will be open, I believe, but the tent is a good idea. Just in case. Hi Rick, I’m doing the trek in about a month but can’t decide whether to go clockwise or anticlockwise. Would you recommend one direction over the other in terms of views? I prefer steep ascents to steep descents does this favour one direction over the other? I truly doubt your knees will be able to tell the difference. The total ascent and decent is so close I suspect the impact force will be about equal. So … no advice. The passes are not all that steep in any case, as I recall. Merely long and high. No severe problem if you are acclimatized and the weather is good. Hi i would prefer anticlockwise like i did last year and i will do it in march again and including the island peak. I hope everything will go smooth. I’d be interested in hiking with you if you have not left already! This article is absolutely great and I would like to ask you a few more questions just to be sure, because I plan to do this trip (EBC 3 passes) next October/November and I want to do it independantly as much as I can. I have done the Kilimanjaro and have some experience with long, solo trekking, but Nepal is all new to me. My first (and main) concern is about accommodation. Are there plenty of lodges along the route, even when taking the three passes? The only map I have doesn’t give a lot of information and I’ve never been able to know if yes or no, it was 100% feasable alone without a tent. Second, do you recommand doing this alone, without any guide or porter? Accepting the idea that I will only take the road when the locals in the lodges say the weather is good enough, is it secure or are there any specific very dangerous parts? Thank you very much, this is incredibly helpful! They are not difficult in good weather, when acclimatized. On any given day there are many people crossing each Pass in October/November. You stay at the closest lodge to the Pass. Then get going early on the day of the crossing. Weather is a factor. You may opt not to go on any given day, depending on the skies. The bigger factor is Everest. When the weather forecast is good, you may want to dash up to Base Camp as quickly as possible. Otherwise, that peak may be clouded over. The one night I tented just over one of the passes was bloody cold. My hiking shoes froze solid. Hi guys my girlfriend and I are planning to trek the 3 passes and the EBC next month. I have been told we need to hire a guide in order to obtain the permits for the trek as of the new law. How true is this?. We would rather not hire a guide and do it on our own. If the going does get tough, we might hire a porter at one of the tea houses. You don’t need a guide or any extra permits to trek to Everest Base Camp or the 3 passes. Some of the guiding companies like to hint that you do. They want your cash. Hi Rick thank you for the information. Our plan is to start early on the 30/03/15 to lukla from KTM and finish the trek by 14/04/15.I will pop in later for more advice, if anything does change. Thanks again. Just wondering what your experience of the snow conditions are like around late April to late May (if you’ve ever trekked in the region during this time). The weather bureau gives you a feel for the the lower altitudes (i.e. 14-25 degrees C). Would you recommend snow pants or gaiters for snow walking if there is any on the passes. Trying to pack light and smart as I want to carry my own things. I’ve gone 5 times. In November. I love the clear, cold skies. But many argue that April / May is better. Prepare for melting snow and muddy conditions, just in case. Maybe I put Pokalde and Kala Pattar in as well… I have 40 days for trekking! Hi Nick, if you have 40 days for trekking, so you have plenty of time. Thing about starting in Jiri and walk to Namche instead of flying to Lukla. We trekked the three passes tour from Jiri to Namche, ChukungRi, Kongma La, EBC, Cho La, Gokyo Ri, Renjo La and flying back from Lukla in 2011. Starting in Jiri needs 5 days more but it’s really worth, because you are walking in a different area — djungle, tea plants, orange trees– so it’s a different and an additional impression to the landscape above Lukla and it’s good for acclimatization and definitly good for condition. I’m not sure, but I would recommend doing the three passes against clock-wise. Your plan takes a lot uphill and time to reach the passes. As i remember as usual the view was clearer in the morning, so reaching the pass early is not a bad idea. We have done the trek in November and we didn’t need crampons. Down from ChoLa, –in your direction up to–, was a little bit slippy, but not difficult. But this depends to the weather conditions. but whatever you will do in this area, you will enjoy it. Click through and compare some of the trekking guiding companies on this page. I was there in Feb and we hired a porter/guide at Lukla itself who turned out to be absolutely fantastic. Let me know if you need one and I’ll send across his details and you could get in touch with him. This is a great article and answered many questions I had in mind including best direction (clockwise/anticlockwise), best time, footwear, tents v/s lodges, etc. Many thanks for putting together the article and also thanks for responding to all questions; those answers are also very informative. 1/ After the recent earthquakes, are there any changes to the route? More importantly, are all the lodges operational? 2/ I have charted out 18-day itinerary (Kathmandu to Kathmandu). I see most people are saying this is a 21-day trek; given that I am going anticlockwise I would have acclimatized sufficiently by the time I reach Loubuche/Gorakshep and then can pace up a bit towards the end after Gokyo, and therefore I believe 18 days would not be too short. I feel 18 days is just right. I could have made it in 15 days on the trail counting 2 rest days on the trail. If you have to catch a flight, however, there’s a chance the planes won’t be flying the day you need to get out. It would be great to have 2-3 days in Kathmandu end of your trip as a safety margin. I’ve not heard of any earthquake problems in the Everest region. First of all… thanks for all of the great info! So many of my questions have been answered on this single site. I have opportunity to travel to Nepal in late August and early September. I realize that this is the end of the monsoon season and I’m curious about what to expect (other than potential rainy days) while doing the 3 passes trek? Should I be concerned about snowfall at the high passes? Any advice would be appreciated. Thanks! Many lodges will be closed. … It’s a bit risky logistics wise. Another major problem is the aftermath of the Earthquake. I can’t imagine what kinds of new problems may have been created even though the Everest region was not affected. Best try to contact people in Kathmandu. Get first hand local advice. Everest three pass trekking is a wonderful trekking itinerary in the region of Everest which also includes some of the popular and tough passes in the region. The three passes which you come across during the trek are Kongma-La Pass, Cho-La Pass and Renjo-La Pass. The trail to the three pass trekking takes you to the Kongma La, Cho La and Renjo La Pass moving towards the higher elevation. Besides, the trekkers will also have the opportunity to enjoy trekking in the Everest region and will also come across some of the popular places in Everest like Namche, Thame and Kala Patthar, also known as the Everest Base Camp. Everest three pass trekking is generally tough in nature as you have to cross the passes all of which are above 5000 meters of altitude. Some of the major attractions of the Everest three pass trekking are the places you come across during the course of the trek. The places include the region of Kalapatthar, Gokyo Valley along with its beautiful lake and the Gokyo peak also called as the Gokyo Ri. Everest High Pass and three passes trekking satisfies the desire of every trekker who intends to trek and explore along the region of Everest and at the same time who also wants to enjoy the wonderful views of the tall mountains of the Everest region. Everest three pass trekking (Kongma-La, Cho La and Renjo-La Pass) starts from the Capital city of Kathmandu when you take a mountain flight to Lukla, flying above the mountains and enjoying the 30 minutes of flight. Upon landing at the Lukla Airport, your real journey starts when you start hiking to Phakding and Namche Bazaar. It is a long itinerary lasting for more than 20 days. I understand that there is a difference between trekking ‘independently’ and trekking ‘solo’. I am planning to do the three passes trek in April, would it be reckless to attempt it on my own without a guide or porter? Additionally, is it really that easy to hire a guide or porter during the trek? I would like to see what I can do myself, but don’t really want tot get caught out further up in the mountains. I did the first two of the three passes independently and solo. No problem. I waited until the weather was good. AND I waited to follow larger guided groups in a couple of cases, once to see where they crossed a snow field. It is VERY easy to hire a guide for a day or more pretty much anywhere. At your guesthouse make a request the night prior for the next day. They will find someone for you. Thanks for the prompt reply! So there isn’t any point at all in securing a guide in Katmandu? I have also thought of a few other questions, if you wouldn’t mind sparing the time?! Is it easy to communicate when getting accommodation during the trek? I was anticipating needing a guide to haggle at the tea houses? The impression I have got is that a guide is absolutely not required for the basecamp part of the trek, can you confirm this?? Can your recommend any specific maps for the trek? I searched for the two you specify in the above text, and they only seem to cover the base camp part of the trek. Or is it easier to just buy a map in Katmandu? The language on the Everest Base Camp trek is English. All the Nepalis speak it there. The majority of people do Base Camp without a guide. It’s a hike. If you have enough days to acclimatize to altitude, it’s not a problem. Wait for Kathmandu to buy a map. You have many options in dozens of bookstores. Most people use the simple maps in their guidebooks, however. I’m really impressed with the details in this article. Kudos for this. But I must admit that few details in this article has to be updated. Leave another comment with anything you’d like to update, Rahul. Alpine Eco Trek is a well-known government licensed trekking and travel company in Nepal, offers a wide range of travel and adventure tours for individuals and groups wishing to visit Nepal, Tibet, Bhutan and India. We are a highly professional team with 19 years of experience organizing heritage, cultural and pilgrimage tours, trekking, climbing and mountaineering expeditions, whitewater rafting, jungle safaris and other activities in the Himalayan regions. I am little bit confused about terms. At the beginning of the article you say: September to mid-November best months, but in the comments above there are comments about September is not the best due to closed lodges, bad weather conditions (monsoon)… So which month is the best? October? And my second question is: How can we prepare to high altitude? How can we to train? We have experience only from European Alps. For me NOVEMBER is the best month. April / May next best. But you could possibly do the hike any time aside from the monsoon. I got sick for a day flying into Lukla. Safest would be to plan extra days in Namche Bazaar (or even Lukla) to acclimatize. If you have 15 days total for Base Camp, acclimatizing should not be a major problem. To add 2 or 3 Passes, 18 days would be better. My partner and I are doing the 3 passes trek in April. We are camping and not using a guide or porter. 2. National park permits- get them in Kathmandu or at park entrance?- is there anyway of getting them Prior to arrival in Kathmandu. We realise there is no need to camp,but we want to. Packing as light as possible. Buy your flight tickets in Kathmandu. Shop several tourist agencies to compare price. Surprisingly, you can get your permit at arrival at the Park gate. But it would be safer to pick it up in Kathmandu if you have time. Hi Rick! First of all, thanks for the amazing information on your website! I’m kind of deciding which trek I want to do in Nepal. One the ultimate things for me is doing a hike like this all by myself. That means no companions, no guides, porters etc. I am aware of the dangers that come with that, so it’s really hard to decide if this trek is not too much. I’m fit, young, and quite experienced with hiking, though I’ve done only a couple hikes in the Himalayas. Do you think that I could do this by myself? How many people will go on this hike per day (mid April)? And is the trek easy to follow? Secondly, how much cold should I expect? I’ve got proper sweaters, a hat and gloves, but I’m mostly wondering about my jacket. It’s a gore-tex, wind and waterproof jacket, but it’s more of a raincoat rather than a thick winter jacket. Combined with proper sweaters, is that enough or not at all? I did 15 days on Everest trails mostly on my own. But you’re never alone. There are hikers everywhere. It’s a treat to be out of sight of other people once in a while. It’s very safe. Probably the safest trek in Nepal after Annapurna. It does go below freezing most nights. The teahouse rooms are not heated. I always take a full hooded down jacket on high treks, just in case. I’m never cold with one of those. You could pick one up a knock-off in Kathmandu for less than $50. I’m still wearing the one I bought for $40. Quality is quite good. What is the two passes trek? Is that Everest base camp and gokyo ri? How does it compare with the three passes? How dangerous is the three passes trek? I have done 3 passes much time but I haven’t been 5th lake. great website,thanks a million for having all your replies.i have a couple of Qs if you dont mind? 1..any reccomadations on hiring a climbing guide? 2..is it possible to go solo and hire a guide from goyko to take me across the pass? 3..is March a good time you reckon? 4..is it possible to do the passes solo or just follow a groups path maybe? 5..in March would it be okay to go over the passes in my walking boots and not crampons? 6..im getting mixed reports on paying for lodges at night.some say lodge is free once you eat there? or do you think theres a fee for staying the night? I’ve never hired a climbing guide. Seems to me all the companies in Nepal hire different licences guides for each trip. So it may not make much difference. It’s easy to hire a guide for a day. For a pass. Ask at any Teahouse. They can set it up. March is a bit early, I’m guessing. But if weather cooperates all 3 passes are quite doable alone. I wouldn’t bring crampons, myself. It costs both for a room and for food. Normally you eat the evening meal where you are sleeping, but you don’t have to. I’ve never had free bed for buying dinner on any of my 6 trips to Nepal. Great article! Thanks you so much for compiling all of this information. I plan to do the hike this coming October/November. Two questions? How much of a detour is it to include Island Peak and Kala Patthar? Also, is it possible to hire a guide for Island Peak at the tea houses or Island Peak base camp? I am looking to do the trek independently but think I should probably have a guide for the summit. Thanks and happy travels! Though I’ve never done it, I believe you CAN hire a guide for Island Peak of the teahouses. Or they may take a commission to find a group for you to join. Not sure about Kala Patthar. I assume it’s the same story. Where is the best place to buy a ticket to lukla? I arrive Tuesday afternoon but wish to get my permit and fly wed afternoon to lukla…will this be possible do you think? There are travel agencies everywhere in Thamel selling Lukla flights. You can’t miss them. Flights are early morning, however, so you’ll have to pack quickly for the trek. Buy it online, offseason it is the cheapest way… Check Tara Air… Paid $167 vs. $179 (from agent) one way to Lukla. Thanks richdrogpa. I added a note about the new trekking permit replacement for TIMS on our information page. Ryan Van Duzer did some nice videos about this trek. I did the Everest trek (from Lamosangu) in 1974 and 1981. Facilities were non existent / very basic but really, you don’t need much. At 67, I’d love to do it again and this website has me tempted. These days I’m a keen cyclist so I’m confident I could develop the fitness needed. Unfortunately, I’ll probably have to do it alone. One thing I’m not clear on is whether you need to take your own sleeping bag as I would really like to keep my pack weight to under 7kg. Staying in Tea Houses you could probably NOT take a sleeping bag. Almost everyone does, however. For comfort. You might take a very light weight sleeping bad and cover yourself with the provided scratchy comforters. Most of the tea house have you able to get blankets in the Everest area, but main season time is better to have your own sleeping bag. This year monsoon jump earlier in Nepal, since 4 day weather has been not good, just raining and cloudy. Everest region is one the wonderful trekking in Nepal for an amazing panorama. here s another detail info for your Everest Three Passes trek. Hi. Is it necessary to book lodges in advance? I did ABC trek four years ago and the lodges close to ABC (Deurali, Macahpuchre BC) and Tadapani were completely booked out. So maybe some places on this trek will be crowded as well and booking in advance is needed? I want to trek next April. Oh and one more question: is there snow in those passes in April? Good question. Is there any way to book tea houses? If so, that would be new to us. You could try asking management at your first teahouse to telephone ahead to your next teahouses for booking. It’s likely they will have the phone numbers. There’s phone coverage all the way to Base Camp. Also, I noticed that a few of the links in the above article are broken. Thanks asis. I’ve taken care of the broken links. And added a link to your site. Thanks Rick. Given that you have been to so many treks around the world, I would like to take your opinion about something. Let me know how I can reach you? Or you could just drop an empty email at asis.shrestha4122 [at] gmail dot com. Enjoy your Norway trek man. Looks fab. It’s great information. Thanks for the info. What about experiencing Nepal’s wonderful places? With himalayan treks, you will have an unforgettable experience while you are on your vacation. Enjoy trekking with some of the professional trekkers in the area. Unwind and relax with the perfect vacation you can experience. Hope this gives some insight. Thanks for really valuable information, I am leaving in 3 days and planning to do 3 passes trek in 19-20 days starting in Phaplu. Anybody need any information or service regarding to trekking or any package tour in Nepal please feel free to contact me. Thanks for the information, Joseph. Did anyone do the three passes trek these last weeks? (March 2019). I heard due to the heavy winter the passes are blocked. yes now is open 3 passes, our guide Nabara already did and back to Lukla today, and many other groups are leading now for the 3 passes trek, but you need mini-crampons. I am Rollo Simth from Canada just return from Everest 3 passes Trek. Yes Everest 3 passes Trek is open but at Lungdhen [4380m] Lodge was not open , We were lucky our Guide Sonam Sherpa got one big dome Tent (Tent for 4 people – we were 7 but nice and worm). We advice – Good if you take one Tent and some rope too. Thanks! I’m trekking solo though. Right now I hear Renjo and Cho la pass is blocked. Hopefully it will clear up soon.